That’s really interesting, too much for me to all read but I appreciate the effort put into this. I do disagree on your first point though. There is such a thing as objective color. Photons have wavelengths, and specific wavelengths are specific colors, regardless of how our eyes and brains interpret them.I read a part of the article you linked, and if you do take into account how the eye and brain interpret colors, there is still objective color. Apparently we do all have different ratio’s of red vs green vs blue cone cells, but as the article says, our brains are still in agreement over what exactly is yellow. So our eyes might be different, but our brains correct that difference. Think about the nature of the visible spectrum. We perceive it as being composed of soft but distinct bands of hues, usually seven or eight : red, orange, yellow, green, cyan, indigo, violet and sometimes fuchsia, which is not a spectral color. Colors such as grey, white, brown, beige, and pink do not correspond to any one frequency, so they cannot be said to map to the wavelength of any particular photon, yet we perceive them as discernible colors. I put scare quotes around the words illusions and actually, because this information has helped me understand that what we see is never an illusion, only our cognitive expectations about that we see. By manipulating the various layers of sensation and perception to expose their conflicts, we can tease out the truth about color, and by extension consciousness. There is no ‘actually’, there is only ‘seems like from some perspective’. The experiment showed that our color perception can be altered for weeks after subjects return to an unaltered optical state*. Our brains correct the difference because they are not translating wavelength of photons but projecting relations within the optical experience as a whole. Now think about the visible range of the electromagnetic spectrum. Does it have seven soft bands or is it an absolutely smooth quantitative continuum? Does the continuum form a wheel with primary and secondary oppositions, or is is an unbounded linear progression? Does it repeat in octaves, where one frequency suddenly recapitulates and merges the beginning and ending of a sequence, or does it monotonously extend into the invisible spectrum? Our eyes tend to differ, and photons might be the same, but color is not photons. 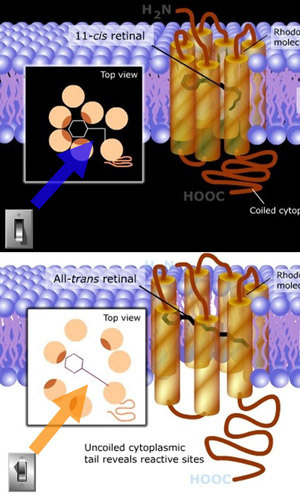 In fact, photons from the outside world only do one thing in our retina, and that’s isomerize rhodopsin molecules – meaning that the proteins in our rod and cone cells are studded with vitamin A molecules which basically become erect in the presence of visible light. From there, the folded proteins in the cells sort of swell open and actually cut off what is know as ‘Dark Current’ – the continuous flow of glutamate which is interpreted as seeing light *in its absence*. Light, in a sense turns our experience of darkness off.